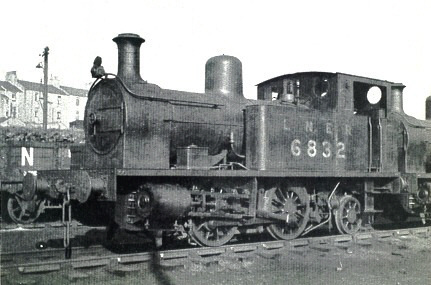 From its formation, the GNSR wanted to use locomotives to work traffic at Aberdeen Docks, but the Harbour Commissioners would only allow horse haulage. In 1915, an agreement was made and the GNSR purchased these two locomotives from Manning, Wardle & Co to work the docks. The GNSR gave them the classification of Class Y. These were overweight by 2 tons, and a further two locomotives were ordered (the Z4s). Eventually, they were allowed on the Aberdeen Docks track, and worked alongside the Z4s. It is unclear when this restriction was lifted, and is unclear where they worked between delivery and the lifting of the restriction (it is known that they did not enter storage). For a while, the Z5s worked with their tanks half full, as a compromise on this weight issue. These two engines were originally numbered 116 and 117, but renumbered to 30 and 32 in August 1915. In 1925, the LNER added 6800 to all of the GNSR locomotives, to give 6830 and 6832. These then became 8192 and 8193 with the 1943 renumbering. Under BR ownership, 60000 was added, as with all other LNER engines. 68193 (originally 117) was withdrawn in 1956, and 68192 (originally 116) was withdrawn in 1960. Both of the Z5s spent most of their lives working at Aberdeen Docks. Occasionally they would run local goods trains, and be hired out to private owners. Both engines remained virtually unchanged during their lives. They even kept their original boilers because there were no spares available. After Grouping, both Z5s kept their GNSR livery (black with red and yellow lining) until WW2 - completely skipping the LNER liveries of black lined with red, and unlined black. However, they were marked with "L N E R" lettering, and during WW2 they were painted in unlined black. Heating Surface: Total: 600 sq.ft. The last Z5 was withdrawn in 1960. No Z5s survive. Agenoria Models sell a 7mm scale (O gauge) kit of the Z5. Thank you Malcolm Peirson for the photograph of BR No. 6832.